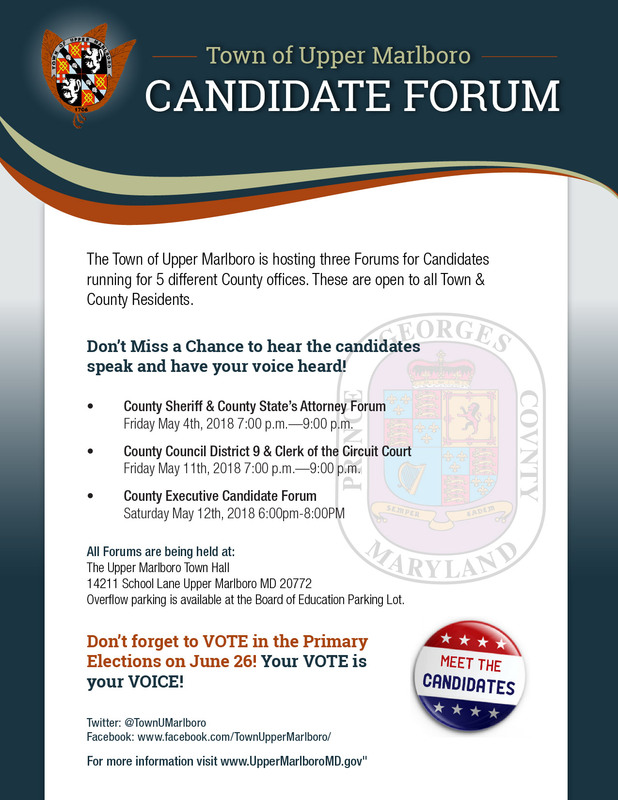 The Town of Upper Marlboro will be hosting 3 evening forums for 5 different County offices. These forums are intended to provide voters from the Upper Marlboro area and County with an opportunity to engage directly with candidates on issues of importance to them in this election. The event is free and open to the public. Participating candidates will be asked to answer questions from the public during this moderated event. These Forums will also be broadcasted LIVE on the Town’s Cable Access Verizon Channel 19 and online on the Town Facebook Page and website. Location: All Forums will be held at the Upper Marlboro Town Hall located at 14211 School Lane Upper Marlboro MD 20772. Public Parking is available at the Board of Education Administration Building Parking lot.